Clive Caldwell. Heard of him? Well, if you’re here because you’re an avid reader of the type of books I review, chances are you’ve heard of him. If you haven’t, don’t feel too bad. He’s Australia’s highest scoring ace of the Second World War and most Australians have not heard of him. It is safe to say, however, that in the past few years that number of Australians has become smaller thanks to the subject of this review. What might stir your interest further is the author of Clive Caldwell, Air Ace, prior to initial research, had not heard of our hero either. He simply had not popped up on her reading radar. It’s not as odd as it sounds. If you have not read this or any other book on CRC, how much do you know about him off the top of your head? Let’s go with what’s generally known (and, sadly, about the sum total of my knowledge retention pre-CCAA): Australia’s highest scoring ace; flew Tomahawks and Kittyhawks in North Africa; had the nickname ‘Killer’; developed shadow-shooting; flew a Spitfire with CR-C as squadron codes; and was part of the infamous ‘Morotai Mutiny’. Not a lot there but, at the same time, there is if you screw down into each statement. However, up until CCAA no one bothered to get into the gritty detail and the majority of written work on this remarkable man was limited to rather generalist articles. Fortunately, this is no longer the case. In 2002, Kristen Alexander and her husband purchased at auction some papers that had belonged to Clive Caldwell. Their original intention had been to sell them on but Kristen sat down and read the letters and became enthralled with the “vibrancy of writing, the immediacy of action and the almost breathless thrill of an operation, written as they were so soon after the actual incidents.” She was hooked and used the documents as the basis for a presentation to her local branch of the Military Historical Society of Australia. This she did to some acclaim including comments about there being a “book in there”. With further research and support from Mrs Caldwell herself and former colleagues of Caldwell’s - such as fellow ace, desert veteran and fighter leader Bobby Gibbes – Kristen’s first book became a reality. Clive Caldwell the man challenges the reader within the first few pages of the book. While there is no reference to him doing so, he advocated shooting downed enemy airmen in their parachutes. Now, this is something we usually associate with those dastardly Germans and barbaric Japanese (stereotypes intended) and not ‘our’ boys. But, this was Clive Caldwell and was part of the reason for his public, but personally disliked, nickname (he had also witnessed a close friend meet that fate ... see, you can’t jump to conclusions with this man). Older than other pilots during training and squadron life, Caldwell was the loner with a job to do. After a patrol he invariably flew home at low-level looking for ground targets. He was always on the hunt and, to some extent, alienated himself from his fellow 250 Squadron pilots. Always looking for ways to improve his natural fighting ability, Caldwell discovered he could practice deflection shooting (aiming for where the enemy would be) by shooting for his aircraft’s shadow on the desert floor. What became a widely-accepted training method was just one of the many skills that saw Caldwell grow into a leader. His initiative, experience and, of course, survival led to an ever-increasing score and desire to pass on what he had learned the hard way. He was often accused of regular, glorious ‘line-shooting’ in the Mess but he saw few other ways to pass on his experience. Command of the legendary 112 Squadron and pioneering another seminal desert development – the Kittybomber – precedes War Bond and flying tours of the US before an eventual return to an Australia that, well, lauds him while at the same time trying to cut his legs out from under him. I’ve come across a few circumstances of senior Australian airmen returning home from Europe only to discover incompetence and jealousy from staff officers senior to them. Caldwell experienced some of this on his return but was back in the thick of it in command of The Spitfire Wing in Darwin after a very short stint instructing. The Australian government had been screaming out for Spitfires to defend the top end. When they finally did arrive, there was little support and ground crews had to make do. With Caldwell in command and adding to his personal score, the Spitfire defence was effective but, because of the high profile, very open to criticism if there was a sniff of a failure. Raid 54 on Darwin, the day the Spitfires ‘all fell into the sea’, is the perfect example. What became a very difficult tactical situation was exacerbated by General MacArthur’s Melbourne headquarters releasing a communiqué after the fact blaming a non-existent weather factor and poor strategy. This was latched onto by all and sundry during the war and since and, unfairly, heaped blame on Caldwell. The resulting analysis of the events and actual truth is a masterpiece of research and interpretation. The Americans had a further hand in Caldwell’s war when General Kenney, and a complicit Australian government, side-lined the Spitfires of 80 Fighter Wing when based on Morotai. After a proper stint instructing, Caldwell had taken command of the Wing but had little to do. The move to Morotai suggested more worthwhile duties but it brought a whole lot of additional problems. The Spitfires continued to struggle for parts and basic supplies to keep a squadron running and quartered were hard to come by. Warned of the RAAF’s inability to meet the demand, Caldwell was advised to acquire a stock of liquor for trading with the well-supplied Americans. Let down by hierarchy, Caldwell’s hand was forced in order to keep his Wing at readiness and the morale of his men high. This same hierarchy then charged Caldwell with illegal liquor trading and the subsequent inquiry rolled into a ball the issues surrounding Caldwell’s involvement in the co-ordinated resignation of senior front-line RAAF officers protesting over the lack of worthwhile assignments. The terms of reference and proceedings of The Barry Inquiry are very well handled by the author and lose none of their impact despite being made easy to read and understand. One might think of the subject as dry but having followed Caldwell this far, you’ll want to see him come out the other side. As suggested above, a more comprehensive study of the man has not been attempted and, it can be argued, might as well not be. Everything, it seems, is here. The writing is honest, to the point and without pretension – the perfect reflection of Caldwell’s character. Numerous direct quotes are used but these fit seamlessly into the main body of text. I found the style a tiny bit clunky at first but, as Kristen must have as she wrote, I found my feet and sailed through the text. By the way, she writes like a girl. Funny I should say this, you ask? Well, yes and no. Who else would have bothered to provide well-written details of Jean Caldwell’s wedding attire? This level of detail is also evident throughout with the copious annotations and extensive bibliography. This style developed by Kristen works well so it will be good to see her let it loose on a lesser-known RAAF personality in the future. Clive Caldwell deserves to be regarded and recognised alongside other Australian aviation greats such as Charles Kingsford Smith, Bert Hinkler and the Reverend John Flynn. To the greater Australian public, I don’t think he is but this book can certainly change that. Here we have a comprehensive biography written by an expert researcher with an eye for detail and the ability to keep things simple and enjoyable. 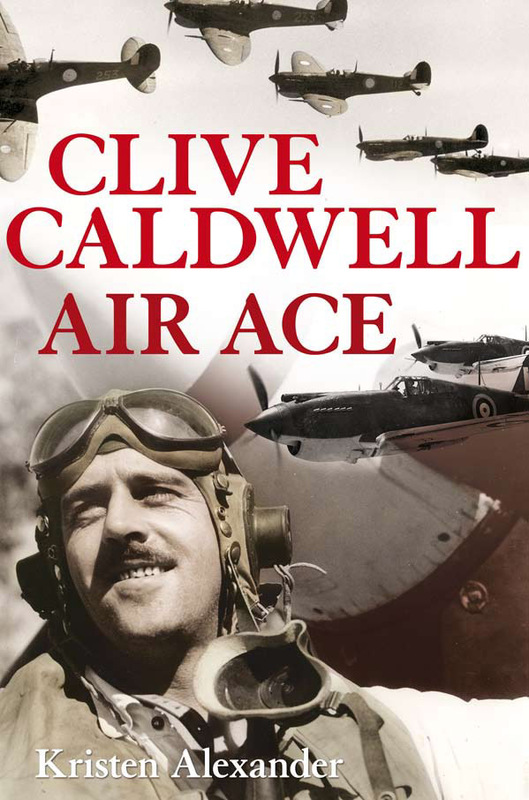 ...A good, solid paperback of more than 300 pages, there are three photo sections which ably illustrate Caldwell's entire life including post-war which many biographies seem to peter out on. Wait till you see the endnotes and bibliography!